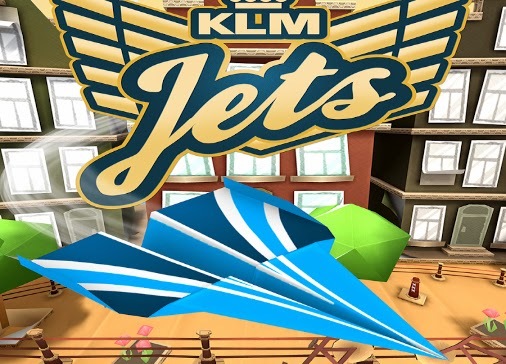 Jets - Papercraft Air-O-Batics - Vrooooom… Try your pilot skills and fly your paper plane through a cardboard world in KLM Royal Dutch Airline’s new game: Jets – Papercraft Air-O-Batics. Explore the old city center of Amsterdam and discover its famous canals with your paper plane. Enjoy the view from the Statue of Liberty and find your way through New York City’s crowded Times Square. Practice your aerobatics in this fun game for kids of all ages. Climb through the ranks by practicing your stunts and tricks on your own, or challenge your friends to a race! Unlock over 25 different skins, including KLM Royal Dutch Airline’s historical paintjobs. Can you discover the game’s secrets and unlock the 3 special planes? - Earn extra in-game rewards by flying KLM Royal Dutch Airlines, and by being at the gate on time for your flight from Amsterdam Schiphol Airport. Jets - Papercraft Air-O-Batics: install APK and play the game!